What can we learn from studying how variations of human genes are spread out around the world? A lot, said population geneticist and Harvard junior fellow Sohini Ramachandran, who spoke at 23andMe this week. Ramachandran focused on how genes spread from one continent to another, and how they vary within each region as well. As an example, she referenced some of the research she did as a graduate student at Stanford, tracing how genetic diversity decreases as the populations sampled get geographically farther away from Africa, long considered the cradle of humanity. For the purposes of measuring genetic diversity, distance from Africa is measured along the same paths that people presumably took at they migrated around the world — over land, without crossing major oceans. Genetic diversity in the Americas (the darker the color, the more diverse the populations). As people migrated, Ramachandran said, genetic diversity decreased due to what she called “serial bottlenecks.” In these cases, though a fairly large number of people might reach one spot, only part of that group would move farther on. By chance, some of the genes in the population would not make it into the new territory. For this reason, Ramachandran said, the researchers find more diversity in DNA samples from African populations than they do in samples from American populations. Because genetic diversity varies based on who got how far, Ramachandran doesn’t just study the genetic variations across continents but between continents as well. One of the topics she looks at is how genetics could support the theories outlined by evolutionary biologist Jared Diamond in his 1998 book, Guns, Germs and Steel. One section of the book she focused on — and which she called her favorite part — was Chapter 10, "Spacious Skies and Tilted Axes." Diamond proposed that continental expansion was partly dependent on how the landmasses are oriented, and that humans brought crops and technology with them as they did so. For example, because Eurasia is on an east-west axis, it was easier for humans to move plants and animals along that axis because the climate was similar. Ramachandran noted that a 2005 study found that humans and domesticated crops for farming spread from east to west about 3,000-5,000 years ago in Europe. On the other hand, Diamond said, the Americas and Africa are oriented on a north-south axis and as people traveled north and south, they would have found that plants and animals they brought along couldn’t always adapt to the seasonal changes. For example, Diamond noted, the Indians in North and Central America had no pack animals because the llamas and alpacas never moved out of the Andes. And the corn grown in Mexico needed thousands of years to adapt to the changes in growing season and day-length to make its way up north. If this holds true on a larger scale as Diamond suggested, then there should be population bottlenecks and more distinct genetic differences between populations across the Americas latitudinally (north-south) than there are longitudinally (east-west). Ramachandran also said that the distinct genetic differences between populations across the Americas latitudinally should be greater than the distinct genetic diversity seen longitudinally (east-west) across Eurasia. Ramachandran and her colleagues reported on the genetic diversity of the Americas last year, but she says more data is needed for this region. She also thinks that Diamond’s proposed north-south axis of orientation isn’t quite right, arguing that it should run northwest-southeast. 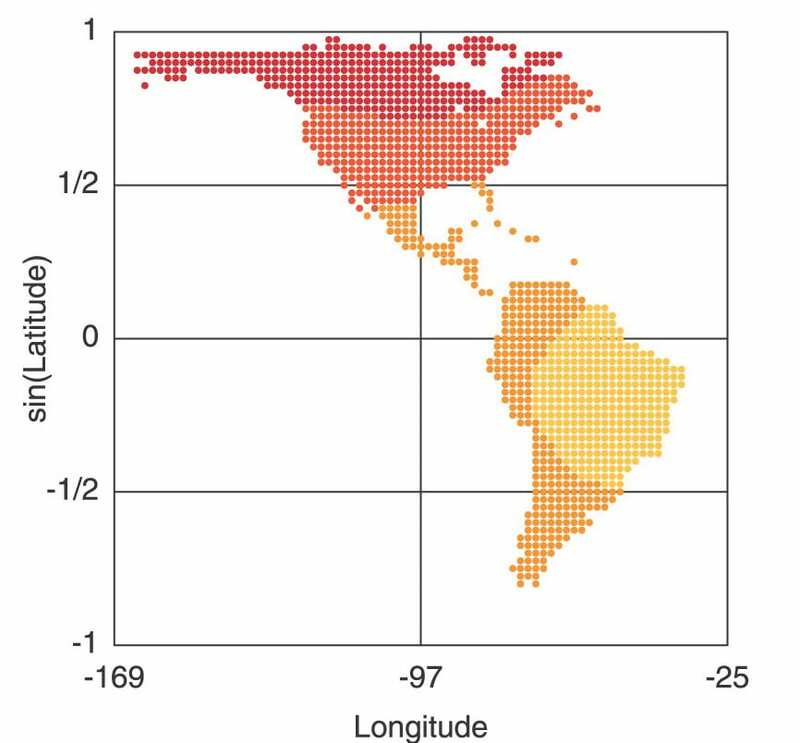 To better study the genetic diversities of the populations across this tilted axis, she and her colleagues change the way they view the map of the world. If the planet were a ball, the point at which it would be spinning on someone’s finger might be the South Pole. Using points such as the southernmost area of South America, South Korea or Sri Lanka as the axis of rotation on which to turn the map, Ramachandran demonstrated how she and her colleagues can look at the genetic diversities of populations in the Americas and Asia and find patterns in the genetic variations that might not be so easily seen from other perspectives. Ramachandran said she hopes to publish her research on the populations in the Americas soon. In the meantime, her talk illustrated how studying genetics can support theories raised about human origins in other areas of study such as archeology, anthropology and history.